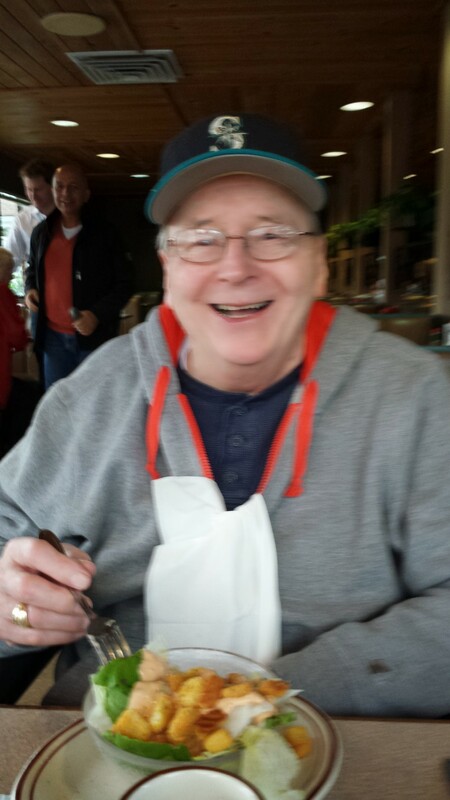 Seniors Can Have Their Steak and Eat It, TOO! Dear Francy; My George had cabin fever and kept asking to go out with me. That is not possible when I am running around…so I planned a simple meal at a local cafe for Sunday Brunch. It takes 2 hrs. to prepare George for leaving the house. Then the wheelchair, car, drive and unload the wheelchair and get him safely inside to a table. Then he often does not know how to make a choice with a multi-dish menu. So, I suggested the PrimeRib and did not even give him the menu. He agreed. When it arrived…he began to dig in…and I was shocked to see he was unable to cut his meat. Wow, his abilites with the combo of Alzheimer’s/Parkinson’s are really going away. I cut his meat…and then he was happy and made his way through the meal with horseradish, au jus and stuffed baked potato…YUMM. But a little bit of me was sad that he had made such a big change in his eating abilities. When mother was living with us (from 95 yrs -100 yrs old) she came with really bad teeth. I don’t know why she had let her teeth go so badly. But they were just a mess…so we had them pulled and got her dentures. During the process of healing and before the dentures…she would tell me how she was so looking forward to having a “real steak or pork chops”. I understood…she was raised and then later cooked through the meat and potato time of home cooking…so she longed for her old flavors. The day that she got her dentures…I had a pork chop with Rice a Roni and asparagus for her dinner and she was a very happy camper. Life changes are hard for all of us…going up a size in your clothes or going down in your abilities to eat food you have always enjoyed. I understand that many folks are eating more chicken, turkey and fish along with a vegetarian diet…but most seniors still enjoy their beef. So here are a few tips to help you through the process of feeding your senior beef. Even if you are not eating it along with them…make sure that they get a good beef dinner every other week. That will keep them happy and give them the protein they need. If you are lucky and can afford fancy cuts of meat…I bless you. I am not. I have to shop for beef and find it within my budget. I do have a couple of tips. One is to buy lesser cuts and then prepare them so they have tenderness and flavor. I also look for un-advertised “manager or in-store” specials. Those specials will have a sign on them for a fast sell..the meat is getting to the end of it’s “sell by” date and so even good cuts can be cut in price. Sometimes it will be less then half the original price. I find these cuts usually are on the shelf in the morning hours before noon…and so I try to hit the stores early so I can take advantage of being first in line. Then there are steaks that are large and the cuts may even be thin…but if it is a good price…I buy them. Usually a good price means a good family size package, but I never worry about that…I am a freezer girl. 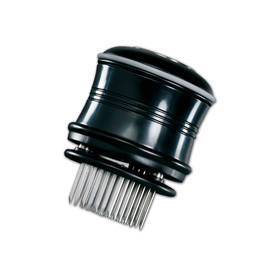 Mother was the Queen of Budgets and she had a trick with less than stellar meat. She would marinate it for 3 to 5 days in a freezer ziplock bag. The meat would come out so tender and tasty you would never know it was not a top/prime cut. So here is the recipe…I know you will enjoy it. Please give it a try. 1/3 cup olive oil poured right into the gallon size Ziplock bag. 1/4 cup chopped fresh parsley * 1 Tbsp minced garlic (I buy a jar of it pre-minced in the veggie department to have handy) * 1 Tbsp dry minced onion * cracked pepper -Do not add salt, use that when the marinade is finished and you are ready to cook the meat. Now if the senior has trouble cutting their food. You can put the meat in the freezer for about 15 minutes before you put it in the marinade. 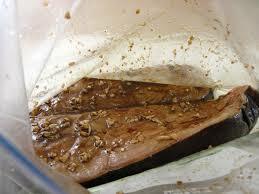 Then take it out and easily cut the meat into strips…marinate it like that. When you are ready to prepare the meat you can then cut it further or it will be soft enough for the senior to cut on their own. RECIPE for preparing the meat once it is marinaded. Stir Fry the meat strips (or cut into smaller bite size) with a great mix of veggies from your own veggie drawer or buy a frozen Stir Fry Veggie Mix…they even have a fresh Stir Fry Mix all made up for you in the fresh veggie isle. You will use a bit of sesame seeds in olive oil and heat it..then quickly fry the meat strips on both sides keeping the mixture moving in the pan and then add in the veggies. Toss the veggies around so they mingle with the meat. When the veggies are getting a little soft…you use a couple of Tbsp of the marinade as the juice for the stir fry and cover the pan…lower the heat for a couple of minutes and you will have a great dinner in under 8 minutes. Serve over rice. Once again you can use strips or smaller bite size cuts of the 3-5 day marinade meat. First heat up the pan with veg/corn oil and get it hot. Slice a medium sweet onion and separate the rings and put into the hot oil…keep on top of this…you want your onion to slowly caramelize and it will smell so good while you stir it around the pan. Then when the onion has taken on that wonderful caramel color add in your meat and stir it all till the meat is browned. Do not over cook it…because the marinade meat cooks fast. Then add in sliced fresh mushrooms and cook till they are tender. You will want to add a small pat of butter and 1 tsp of the minced garlic while you are stirring the mushrooms. In another small pan or in the microwave…make up a pre-packaged brown gravy mix…or mushroom gravy mix. 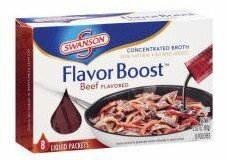 I like to use my favorite Swanson’s Beef Boost Seasoning Packets with a little water in a pan and stir in Wonder Flour and it will thicken up in no time. YUMM…love a quick nice gravy.